Mrs. Arneson. 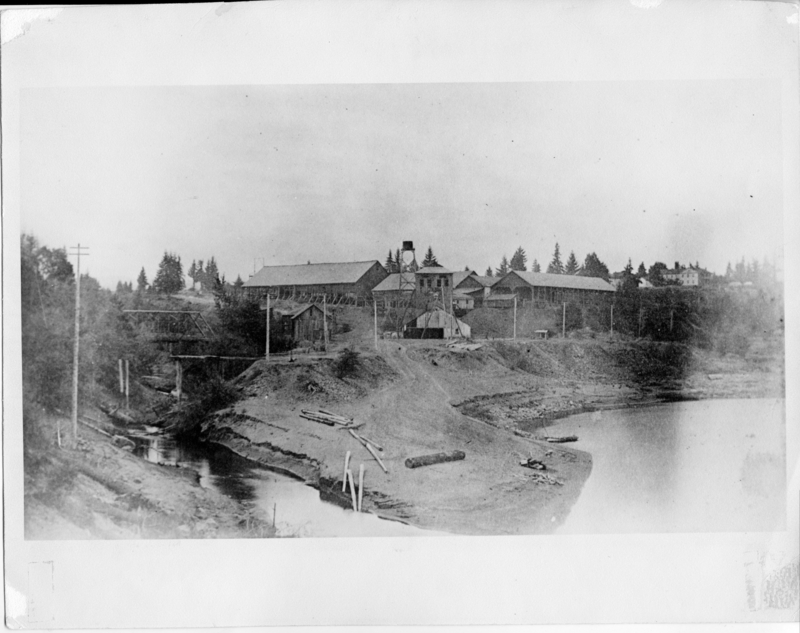 Photo of the Oswego Iron Co. smelter, 1877-1882. Note the raised stack house & the water tower on raised platform. Photo caption: ""1st bridge over Sucker Creek. Tower, sheds, & machine shop of old furnace [Oswego Iron Co.]. Boat landing on hill to right is 1st Bishop Scott Academy, front & upper varanda. White building to left of academy is Mr. (Geo. W.) Prosser's store & 1st post office."" L.O. Chamber of Commerce. OA#122. Transcription Mrs. Arneson. Photo of the Oswego Iron Co. smelter, 1877-1882. Note the raised stack house & the water tower on raised platform. Photo caption: ""1st bridge over Sucker Creek. Tower, sheds, & machine shop of old furnace [Oswego Iron Co.]. Boat landing on hill to right is 1st Bishop Scott Academy, front & upper varanda. White building to left of academy is Mr. (Geo. W.) Prosser's store & 1st post office."" L.O. Chamber of Commerce. OA#122.